Histone synthesis in Leishmania is tightly coupled to DNA replication by a post-transcriptional mechanism operating at the level of translation. In this work we have analyzed the implication of the 5' and 3' untranslated regions (UTR) in the cell cycle regulated expression of the histone H2A in Leishmania infantum. For that purpose, L. infantum promastigotes were stably transfected with different plasmid constructs in which the CAT coding region used as a reporter was flanked by the 5' and 3' UTR regions of the different H2A genes. 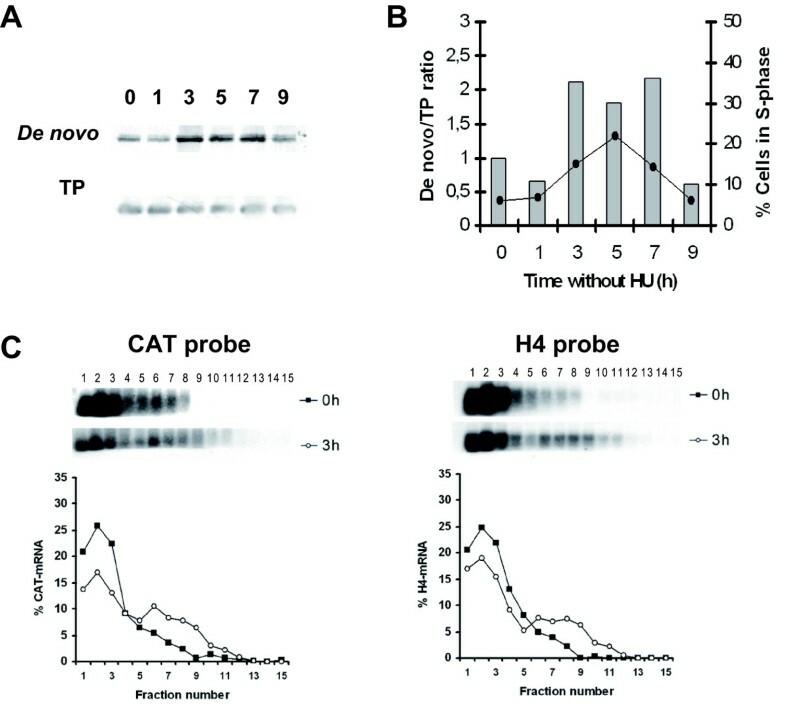 We report that in spite of their sequence differences, histone H2A 5' and 3' UTRs conferred a cell cycle dependent pattern of expression on the CAT reporter since de novo synthesis of CAT increased when parasites enter the S phase. Using one established L. infantum cell line we showed that CAT expression is controlled by the same regulatory events that control the endogenous histone gene expression. Thus, although we did not detect changes in the level of CAT mRNAs during cell cycle progression, a drastic change in the polysome profiles of CAT mRNAs was observed during the progression from G1 to S phase. In the S phase CAT mRNAs were on polyribosomal fractions, but in the G1 phase the association of CAT transcripts with ribosomes was impaired. Furthermore, it was determined that the addition of just the H2A 3' UTR to the CAT reporter gene is sufficient to achieve a similar pattern of post-transcriptional regulation indicating that this region contains the major regulatory sequences involved in the cell cycle dependent expression of the H2A genes. On the other hand, although CAT transcripts bearing the H2A 5' alone were translated both in the G1 and S phase, higher percentages of transcripts were detected on polyribosomes in the S phase correlating with an increase in the de novo synthesis of CAT. Thus, it can be concluded that this region also contributes, although to a minor extent than the 3' UTR, in the enhancement of translation in the S phase relative to the G1 phase. Our findings indicate that both, the 5' and the 3' UTRs contain sequence elements that contribute to the cell cycle expression of L. infantum H2A. The 3' UTR region is essential for cell cycle dependent translation of the L. infantum H2A transcripts whereas the 5' UTR has a minor contribution in their S phase dependent translation. Genes encoding histones are one of the best studied examples of cell cycle regulated genes in eukaryotic organisms. Multiple levels of control operate in the cell in order to restrict the synthesis of histones to the S phase of the cell cycle. In mammalian cells, cell-cycle dependent histone genes are regulated at the level of transcription, pre-mRNA processing and mRNA stability . Processing and stability are controlled by the interaction between a stem loop binding protein (SLBP) and a conserved stem-loop element present in the 3' UTRs of the histone transcripts, that are not polyadenylated [2, 3]. Also, SLBP stimulates translation of histone mRNAs during the S phase of the cell cycle . In yeast and other lower eukaryotes histone mRNAs are polyadenylated and do not terminate with these stem-loop structures. In these organisms the S phase dependent expression of histone genes is controlled mainly at the transcription level, but also post-transcriptional regulation results in the preferential degradation of histone mRNAs outside of the S phase in Saccharomyces cerevisiae [5–7]. As it occurs in lower eukaryotes the trypanosomatid histone mRNAs are polyadenylated (reviewed by () but histone gene transcription appears to be constitutive as it is the case for most genes, in correlation to the lack of regulated RNA polymerase II promoters described for these organisms . Although histone gene transcription is not coordinated with DNA replication, in Trypanosoma cruzi  and Leishmania infantum  the core histone biosynthesis is tightly coupled with DNA synthesis during the cell cycle. The molecular mechanism controlling the cell-cycle regulated expression of histone genes differs among trypanosomatids. In Trypanosoma sp. mRNA stability plays a major role in histone expression (reviewed by ). In T. cruzi the use of inhibitors of DNA synthesis has shown that the histone mRNA levels are coupled to the rate of DNA synthesis [13, 14] and that the histone mRNA levels peak during the S phase of the cell cycle [10, 15]. Similarly, in Trypanosoma brucei the abundance of histone H2B mRNAs decreased after growing parasites in the presence of the DNA synthesis inhibitor hydroxyurea (HU)  making histone mRNAs undetectable out of the S phase by in situ hybridization analysis . 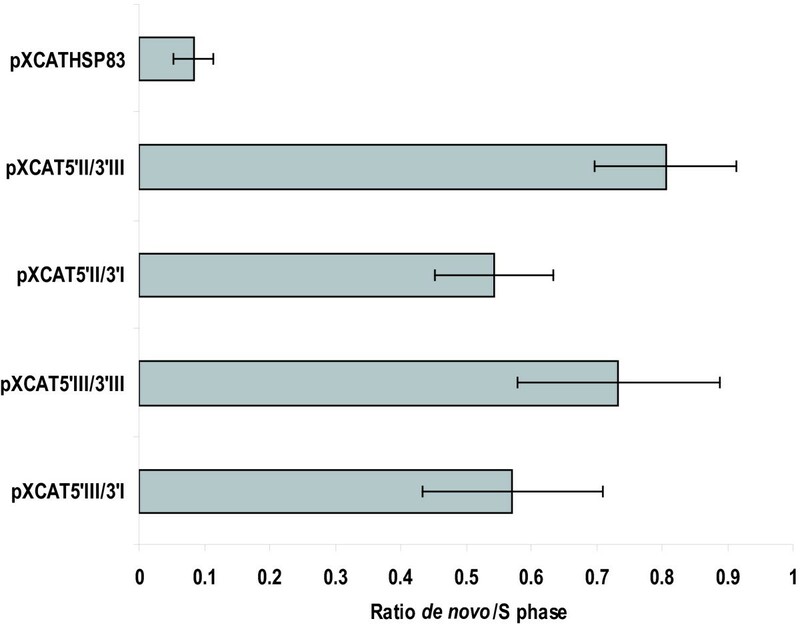 Contrary to the situation in Trypanosoma sp., the histone mRNA levels in Leishmania do not decrease after treatments with DNA synthesis inhibitors [18–20]. Histone biosynthesis is regulated by a mechanism involving a translational control that is exerted on histone mRNAs in the absence of DNA synthesis . Even though there are no significant variations in the steady-state levels of Leishmania histone mRNAs along the cell cycle, drastic changes in the polysome profiles of histone mRNAs were observed during the progression from the G1 to the S phase. Thus, in the G1 phase the association of the histone transcripts with ribosomes was impaired and in the S phase histone mRNAs are present in polyribosome fractions . A regulatory model in which the cell cycle synthesis of histones in Leishmania is controlled through reversible interactions of protein factors that modulate translation of histone mRNAs has been proposed . This mechanism would involve the existence of cis-regulatory signals in the histone mRNAs where specific RNA binding proteins are bound. In all trypanosomatids protein coding genes are organized as large clusters on the same DNA strand and transcribed from undefined promoters as large polycistronic precursor RNAs. Polycistronic transcripts mature by trans-splicing which results in the addition of a short capped leader (39-mer) to the 5' end of mRNAs and by 3' processing that includes cleavage and polyadenylation . Trans-splicing and polyadenylation are coupled mechanistically and the poly(A) site selection seems to be specified by the position of the downstream splice acceptor site . Given that regulated gene expression in Leishmania has been related with post-transcriptional events mainly involving sequences present in the 5' and 3' UTRs , in the present work we have analyzed the involvement of these regions in the cell cycle dependent expression of the L. infantum H2A genes. For that purpose the expression of a reporter gene was analyzed in parasite cell lines stably transfected with different plasmid constructs containing combinations of the Leishmania H2A 5' and 3' UTRs. Two H2A loci are present in the L. infantum genome each one located in a different chromosome (Chr21 and Chr29 ) (Fig. 1A). The three gene copies located in each locus although highly conserved in the coding region present major sequence differences in the 5' UTRs and in the 3' UTRs. There are four types of 5' UTRs, named 5' UTR-I to -IV, with remarkable sequence conservation between the 5' UTR-I and 5' UTR-II and between the 5' UTR-III and 5' UTR-IV, respectively . On the other hand, in the H2A loci there are three types of 3' UTR that are completely divergent in their nucleotide sequence (namely 3' UTR-I, -II and -III). An analysis of the relative steady-state levels of the different L. infantum H2A mRNAs revealed that transcripts containing the 3' UTR-I and 3' UTR-III account for the majority of the H2A transcripts in logarithmic-phase growing promastigotes. In addition, the 3' UTR-I containing transcripts are approximately 7-fold more abundant than those containing the 3' UTR-III. Very low steady-state levels were found for transcripts that contain the 3' UTR-II . For that reason 3'UTR-II has been excluded in our analysis. DNA constructs. (A) Schematic representation of the two Leishmania infantum H2A loci. The names of the genes are indicated below the maps. The locations of the different 5'(I-IV) and 3' UTR (I-III) are indicated on the diagram. Due to the sequence similarity 5'UTR-I and -II are represented as white boxes and 5'UTR-III and -IV are represented as black boxes. These sequences are in the EMBL databases under the accession numbers AJ419625 and AJ419627. (B) Generic representation of the pX63NEO recombinant vector. Position of the Bam HI cut sites employed in the cloning are indicated as B. Positions of the 5'UTR + upstream regions (UPR) and 3' UTR + downstream regions (DNR) relative to CAT gene coding region are indicated. Transcriptional directions of the NEO and CAT genes are as indicated. (C) Schematic outlines of the constructs used in this work indicating the name of the clone and the type of 5'UTR+UPR and 3'UTR+DNR included around the CAT coding region. (D) Northern blots of RNA from promastigotes stably transfected with the different constructs and hybridized with radiollabeled oligonucleotide complementary to the 3' terminal region of CAT gene coding region. Ethidium bromide staining of the corresponding gel is also shown (rRNA panel). Constructs containing each one of the two expressed 3' UTR (-I and -III) combined with each one of the 5' UTR types (-II and -III) were cloned downstream and upstream to the CAT reporter gene, respectively. All the constructs were subcloned into the trypanosomatid expression vector pX63NEO in opposite direction with respect to the NEO gene that is controlled by the regulatory regions of the DHFR-TS gene (Fig. 1B). Thus, the reporter gene may be expressed independently of the regulatory regions included in the pX63NEO plasmid . A schematic representation of the different constructs containing the CAT reporter is shown in Fig. 1C. Sequences located upstream of the 5' UTR and downstream of the 3' UTR were included for correct trans-splicing and polyadenylation of the CAT transcripts (see Methods section for a detailed description). Northern blot analysis of stably transfected cell lines containing plasmids pXCAT5'III/3'I (regulatory regions of gene H2A4), pXCAT5'II/3'III (regulatory regions of gene H2A5) and plasmids pXCAT5'III/3'III and pXCAT5'II/3'I (chimeric genes in which regulatory regions from gene H2A4 and H2A5 were combined) gave rise to a single CAT transcript of approximately 1 Kb (Fig 1D). This size is in accordance with a correct RNA processing as expected from the length of the different H2A mRNAs . The boundaries of the 5' UTRs and 3' UTRs of the different CAT transcripts were defined by an RT-PCR approach (see Methods). The presence of the H2A 3' UTRs seems to confer higher stability to the reporter transcripts since the steady-state level of CAT RNAs in the pXCAT5'H2A cell line was lower when compared to the other ones. In this cell line a single band of approximately 1.7 Kb was observed, in accordance with the boundaries of the 5' UTR of gene H2A4 and 3' UTR of gene HSP83 included in the construct determined by RT-PCR (see Methods). 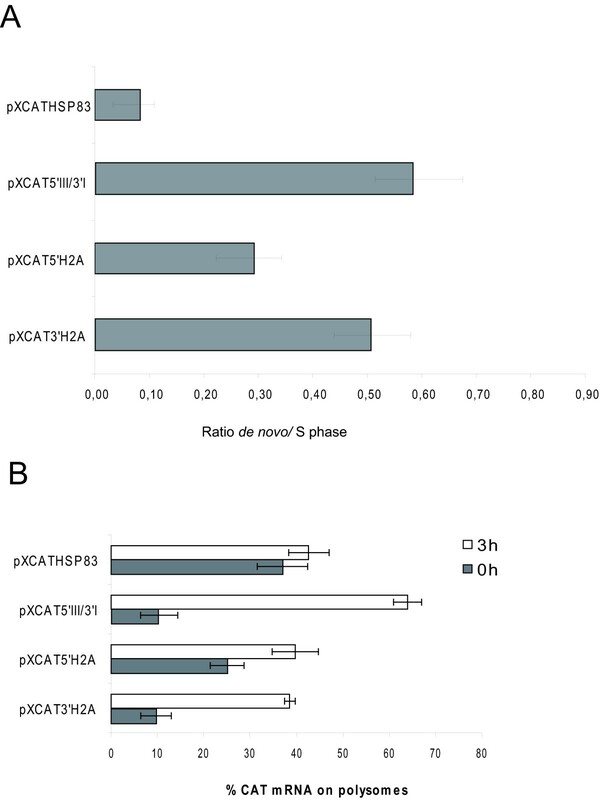 A cell line stably transfected with plasmid pXCATHSP83 (composed of the 5' and 3' regions of HSP83 gene controlling CAT expression) used as control, gave rise to single band of approximately 1.9 Kb (Fig. 1D), as expected after the processing of HSP83 UTRs [27, 28] (see Methods). Fig. 2 summarizes the studies on the effect of the flanking sequences of H2A genes on the cell cycle dependent expression of the CAT gene. For that purpose the different transfected promastigote cell lines were treated for 12 h with hydroxyurea (HU) and after drug removal cells were collected at different time periods and stained with propidium iodide to determine the percentage of cells in the different cell-cycle phases. HU removal resulted in a semi-synchronous entry into the cell cycle in L. infantum promastigotes, in line with previous reports . At the same time the rate of the de novo synthesis of CAT was determined by immunoprecipitation with an anti-CAT polyclonal antibody on protein extracts labelled with [35S]methionine. The autoradiograph exposure of the blot showed that 35S-labelling of CAT reached a maximum at 3 h and then decreased to initial levels 9 h after HU removal for all the cell lines containing the regulatory regions of the different H2A genes (Fig. 2A–D). Densitometric analysis of the results showed a 3- to 4-fold increase at the 3 h point, correlating to the maximum percentage of cells in the S phase determined by flow cytometry. On the other hand, the amount of radioactivity bound to the immunoprecipitated CAT in the cell line transfected with pXCATHSP83 plasmid did not show the cell cycle specific expression profile observed for the other constructs (Fig. 2E). Since in the context of these experiments variations were observed in the percentage of cells in the S phase (3 h after HU removal) three independent experiments were performed with all the cell lines showed in Fig. 2, and the ratio between the de novo synthesis (normalised to the total amount of CAT) and cells in the S phase (3 h after HU removal) was determined. A significant increase was observed in this ratio when comparing the transfectants bearing the different H2A gene regulatory regions to the transfectant with the HSP83 gene UTRs (Fig. 3). In Fig. 3 it is also shown that transfectants bearing the 3' UTR-III, independently of the 5' UTR, have a moderately higher ratio which is indicative of a higher translational potential. Expression of CAT along the cell cycle in the different transfected Leishmania cell lines. Protein extracts from 35S-labelled L. infantum promastigotes transfected with the indicated constructs and treated with 5 mM HU either for 12 h (lane 0) or at the indicated time period (in h) after removal of the drug, were used to immunoprecipitate CAT. After immunoprecipitation, protein samples were separated by SDS/PAGE and transferred on to a nitrocellulose membrane. After autoradiographic exposure (De novo panels), membranes were incubated with the anti-CAT antibody to reveal the total amount of CAT present in the samples (TP panels). Graphics show the ratio between de novo synthesis of CAT and total amount of CAT determined by densitometric quantification (columns) and the percentage of cells in the S phase of the cell cycle determined by flow cytometric analysis (line). Data correspond to one representative experiment of three independent assays with similar results. Thus, it can be concluded that the presence of the H2A regulatory regions confers a cell cycle dependent expression of CAT as it has previously been reported for Leishmania histone synthesis . 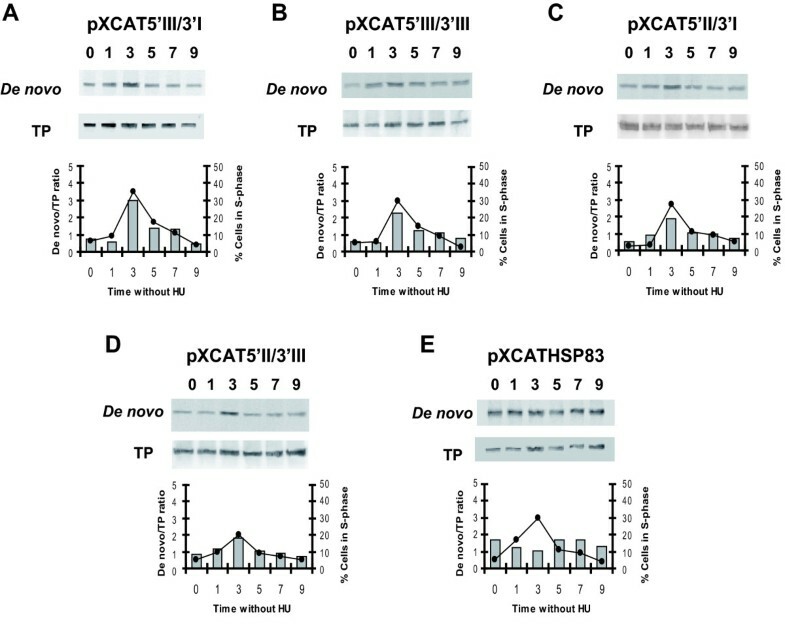 In order to analyze where the control of CAT gene expression is exerted, two different assays using promastigotes stably transfected with pXCAT5'III/3'I construct (containing the regulatory regions of gene H2A4) were performed. Firstly, a Northern blot of RNA isolated at various time points after HU release was hybridized with a CAT probe (Fig. 4A). Quantification of the obtained radioactive signals normalized to all ribosomal rRNA bands indicated that CAT mRNA levels remain constant throughout the cell cycle (Fig. 4B). Secondly, we analyzed the distribution of CAT mRNAs on polyribosomes during the progression from G1 and S phase. For that purpose the polysomal profile of the CAT transcripts in promastigotes at phase G1 (parasites treated for 12 h with 5 mM HU) and mid-S phase (3 h after HU release) was studied by sucrose gradient centrifugation of cytosolic extracts and Northern blotting. According to the rRNA species distribution on the gradients deduced from the ethidium bromide staining, fractions 1–5 should be considered to be free of functional ribosomes, since they either do not contain rRNAs or the rRNAs are not in equimolecular amounts. Equimolarity of the three larger 18 S, 24 S-α and 24 S-β rRNAs composing the L. infantum ribosome  was observed between aliquots 6–15 that correspond with the polyribosomal fractions (Fig. 4C). The distribution of the CAT mRNAs along the sucrose gradient fractions is shown in Fig 4D. During the G1 phase, CAT transcripts concentrate on the top of the gradient showing a peak out of the polysome fractions. On the contrary, when 50% of the cells were in the S phase CAT mRNA was detected in the bottom fractions. In particular, a secondary peak containing 57% of the CAT mRNAs was observed in the polyribosomal fractions. A similar pattern was obtained when blots were re-hybridized with a H4 probe although the percentage of H4 mRNAs in the polyribosome fractions was lower (41% of the H4 mRNAs) and the secondary peak was located in the central fractions of the sucrose gradient. The same results showed for H4 were obtained when a H2A coding region probe was tested in these blots (data not shown). Differences in the translational degree observed in the CAT mRNAs polysome profiles in the S phase relative to the endogenous H4 or H2A could be related to the influence of the CAT coding region on the secondary structure of the mRNAs since it has been recently described that the coding regions of different reporter genes may affect the translational efficiency in kinetoplastids . 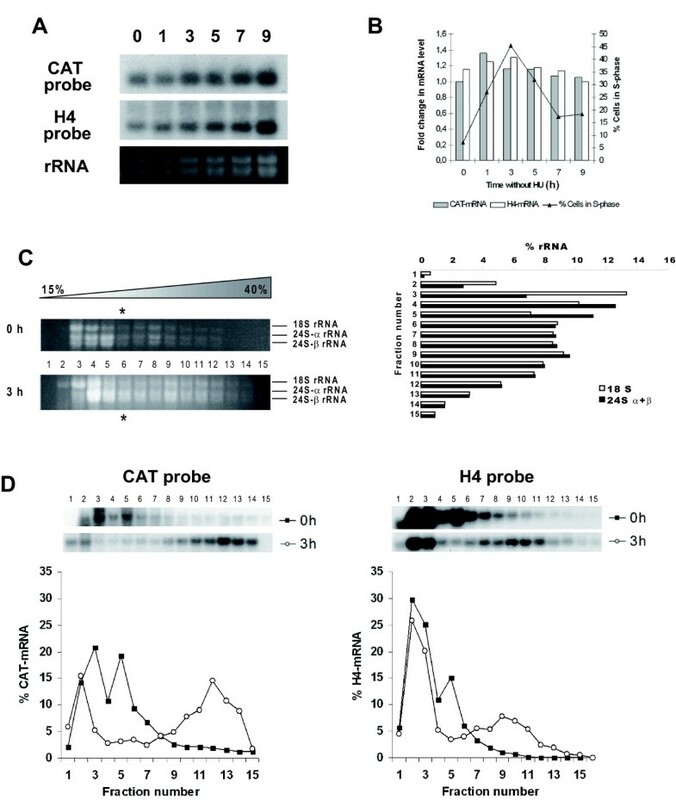 Together, these results demonstrate that the cell-cycle related expression of CAT is controlled in the transfected parasites by the same regulatory events that control the expression of the histone genes. Cell cycle dependent expression of CAT is regulated at the translational level. (A) Northern-blot analysis of total RNA samples for promastigotes transfected with pXCAT5'III/3'I treated with 5 mM HU either for 12 h (lane 0) or at the indicated time (in h) after removal of the drug. The blot was sequentially probed with an oligonucleotide reverse and complementary to the 3' end of the CAT coding region and with a cDNA coding for L. infantum H4. Ethidium bromide staining of the corresponding gel is also shown (rRNA panel). (B) Graphic showing the ratio between the densitometric values of the blots hybridized with CAT probe (black columns) or H4 probe (white columns) and the rRNA bands revealed by ethidium bromide staining of the gel. Also the percentage of cells in the S phase of the cell cycle determined by flow cytometric analysis (black line) is shown. (C) Cytoplasmic extracts from L. infantum promastigotes transfected with pXCAT5'III/3'I and treated with 5 mM HU either for 12 h or 3 h after drug removal were separated on 15–40% sucrose linear gradients and RNA was purified and resolved in a 1% agarose-formaldehyde gel. The ethidium bromide staining of the gel is shown. Migration of 18 S, 24 S-α and 24 S-β are indicated. A graphic showing the densitometric values of the gel obtained 3 h after drug removal is included. The migration of the 80S particles has been marked in the gradients by an asterisk. (D) RNA from these gels were transferred on to nylon membranes and sequentially probed with the CAT and H4 probes. The autoradiographic exposure of the blot and the densitometric analysis is shown. Results are plotted as percentages of the total signal to allow direct comparison of the polysomal profiles. Data correspond to one representative experiment of three independent assays with similar results. To examine the role of the histone 3' UTR regions in the control of mRNA translation we made a new construct, pXCAT3'H2A, in which the CAT reporter coding region was located between the 5' regulatory regions of HSP83 gene and the 3' regulatory regions of H2A4 gene (Fig. 1C). Northern blot analysis of stably transfected cells lines containing this construct gave rise to a single CAT transcript of approximately 1.2 Kb as expected after correct 5' and 3' processing or the mRNA (Fig. 1D). The steady state level of these transcripts remained constant throughout the cell cycle (data not shown) and had similar levels to what was observed for the cell line transfected with the plasmid containing both H2A4 gene regulatory regions (pXCAT5'III/3'I) (Fig. 1D). On the other hand, a good correlation was observed between the percentage of cells in the S phase of the cell cycle and the 35S-labelling of CAT (Fig. 5AB) indicating a cell cycle dependent accumulation of de novo synthesized CAT in promastigotes transfected with pXCAT3'H2A. Quantification of the radioactive signal revealed a 2-fold increase in the S phase (Fig 5B). Interestingly, the ratio between the de novo synthesis and number of cells in the S phase is similar to that obtained for the pXCAT5'III/3'I transfectants (0.66 ± 0.12). These results are in agreement with the CAT mRNAs polysome profiles showed in Fig. 5C. Most CAT mRNAs were not bound to functional ribosomes in the G1 phase (12% of the CAT transcripts), but shifted to polyribosome fractions during the S phase (48% of the CAT mRNAs). Remarkably, the position of the secondary peak in the central fractions in S phase blot (located in fractions 5–8), was similar to that obtained for the H4 transcripts and to that described for the endogenous H2A transcripts . Effect of the H2A4 3' UTR on regulation of CAT expression. (A) Protein extracts from 35S-labelled L. infantum promastigotes transfected with pXCAT3'H2A and treated with 5 mM HU either for 12 h (lane 0) or at the indicated time period (in h) after removal of the drug, were used to immunoprecipitate CAT. After immunoprecipitation, protein samples were separated by SDS/PAGE and transferred on to a nitrocellulose membrane. Authoradiography (De novo panel) or Western blot with anti-CAT antibodies to reveal the total amount of CAT present in the samples (TP panel) is shown. (B) Densitometric analysis showing the ratio between de novo synthesis of CAT and total amount of CAT (columns). The percentage of cells in the S phase is also included (black line). The assay was repeated twice with similar results. (C) Northern blots prepared with RNA samples separated by sucrose gradients from promastigotes transfected with pXCAT3'H2A and treated 12 with HU or 3 h after drug removal were sequentially hybridized with the CAT and the H4 probe. The autoradiographic exposure of the blots and the densitometric analysis is shown. Data correspond to one representative experiment of three independent assays with similar results. Thus, it can be concluded that a sequence segment located in the 3' UTR region of the H2A4 gene contains the cis-sequence element(s) responsible for the cell cycle regulated translation reported for the Leishmania histone genes. To elucidate the role of the histone H2A 5' UTR in the S phase dependent translation of the CAT gene we made a new construct in which the CAT reporter gene was placed between the 5' regulatory regions of H2A4 gene and the 3' regulatory regions of HSP83 gene. The construct, named pXCAT5'H2A (Fig. 1C), gave rise to a single CAT transcript of approximately 1.7 Kb in a Northern blot performed with total RNA from stably transfected cells lines containing this construct (Fig. 1D). Remarkably, the steady state level of CAT transcripts obtained from this cell line were lower to that observed in cell lines transfected with plasmids bearing both H2A regulatory regions (pXCAT5'III/3'I) or the 3'UTR alone (pXCAT3'H2A) (Fig. 1D). 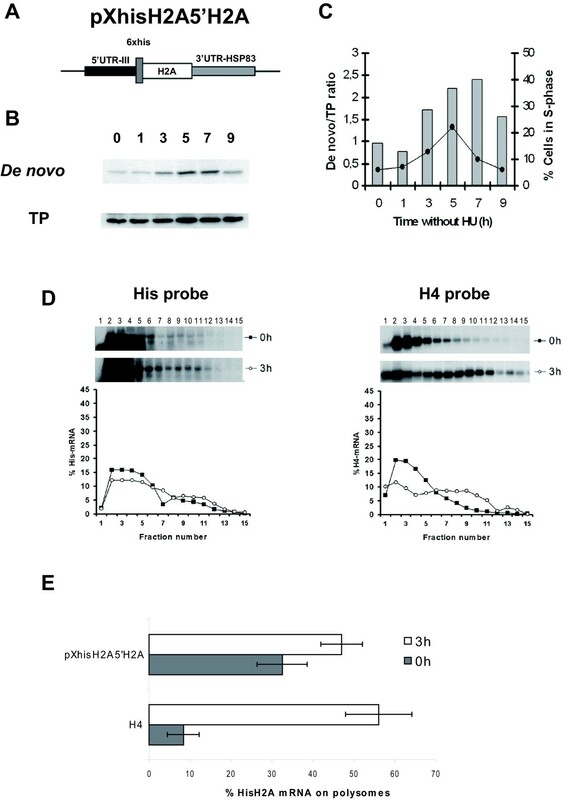 Immunoprecipitation experiments with promastigotes transfected with the pXCAT5'H2A plasmid showed an increase in the metabolic labelling of CAT at 3 h after HU release (Fig. 6A). Densitometric analysis showed a 2-fold increase in the labelling of CAT when cells enter into the S phase (Fig. 6B). However, analysis of the polysomal profiles of cells transfected with pXCAT5'H2A revealed that CAT transcripts were actively translated at the G1 phase since they were associated with polyribosomal fractions (27% of the CAT mRNAs) at time 0 h after HU release (Fig. 6C). It was also observed that a higher percentage of transcripts were located in the polyribosomal fractions (44% of the CAT mRNAs) when cells progress into the S phase. In addition, the location of the reporter mRNAs in the bottom fractions of the sucrose gradient indicates a high translation rate for transcripts bearing the combination of the H2A 5' UTR and the CAT coding region in both cell cycle G1 and S phase. Subsequently, we analyzed the polysome profiles of the CAT transcripts in parasites transfected with the pXCATHSP83, a cell line that did not show cell cycle regulated expression of CAT. The results indicate that similar percentages of these transcripts were located into polysomes in the G1 (45% of the CAT mRNAs) and in the S phase (50%) (Fig. 6D). 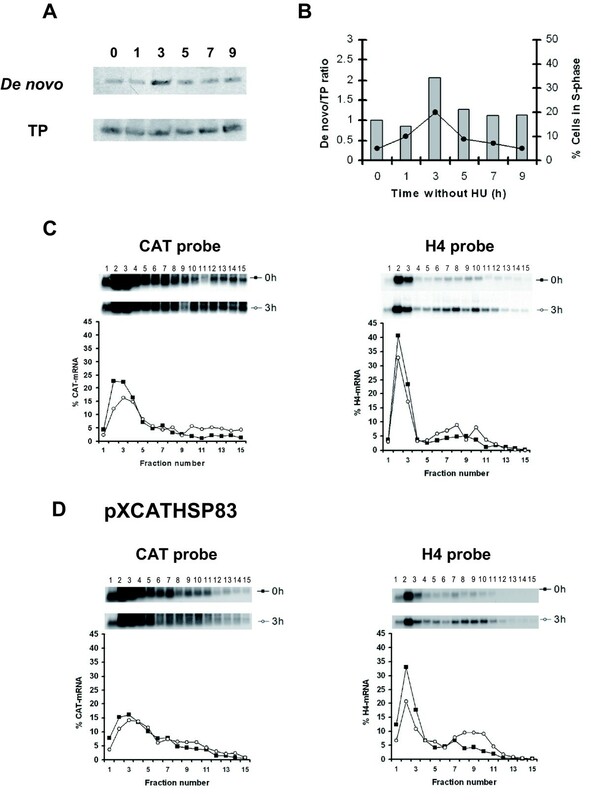 Contrary to CAT transcripts from the pXCAT5'H2A cell line, CAT transcripts from parasite transfected with PXCATHSP83 were in a similar active translational status along the cell cycle. Thus, it can be concluded that when the 5' UTR region of the H2A4 gene is located upstream of the reporter gene the translation level of CAT transcripts is increased in the S phase. Effect of the H2A4 5' UTR on regulation of CAT expression. (A) Protein extracts from 35S-labelled L. infantum promastigotes transfected with pXCAT5'H2A and treated with 5 mM HU either for 12 h (lane 0) or at the indicated time period (in h) after removal of the drug, were used to immunoprecipitate CAT. After immunoprecipitation, protein samples were separated by SDS/PAGE and transferred on to a nitrocellulose membrane. Autoradiography (De novo panel) or Western blot with anti-CAT antibodies to reveal the total amount of CAT present in the samples (TP panel) is shown. (B) Densitometric analysis showing the ratio between the de novo synthesis of CAT and total amount of CAT (columns). The percentage of cells in the S phase is also included (black line). Northern blots prepared with RNA samples separated by sucrose gradients from promastigotes transfected with pXCAT5'H2A (C) or pXCATHSP83 (D) treated 12 with HU (lane 0) or 3 h after drug removal were sequentially hybridized with the CAT and the H4 probe. The autoradiographic exposure of the blots and the densitometric analysis is shown. Data correspond to one representative experiment of three independent assays with similar results. Taking into account the variations observed in the percentages of cells in the S-phase between experiments, three independent assays were performed with the cell lines transfected with pXCATHSP83, pXCAT5'III/3'I, pXCAT5'H2A and pXCAT3'H2A constructs. The ratio between the de novo synthesis of CAT (normalised to the total amount) and the amount of cells in the S phase in the different transfected cell lines was determined (Fig. 7A). An increase was observed in this ratio in both the pXCAT5'H2A and pXCAT3'H2A cell lines compared with pXCATHSP83 cell line. In addition, the ratio obtained with the parasites transfected with pXCAT3'H2A was higher than that observed for parasites transfected with pXCAT5'H2A. This ratio closely resembles the de novo synthesis ratio observed in the parasites transfected with the construct containing the two H2A regulatory regions (pXCAT5'III/3'I). In the same cell lines the percentage of CAT mRNA on polysomes was also analyzed (Fig. 7B). The distribution of the CAT transcripts on polysomes in parasites transfected with pXCAT3'H2A and pXCAT5'III/3'I constructs showed similar profiles, whereas a higher percentage of CAT transcripts was found on polysomes in the G1 phase in the pXCAT5'H2A transfected cell line. Altogether, these data indicate that although the 5' UTR and 3' UTR regions of the H2A gene are implicated in protein synthesis regulation, the 3' UTR plays the major role in the observed cell cycle dependent translation. Analysis of the CAT cell cycle regulated expression in different constructs. (A) Ratio between the de novo CAT synthesis (normalised to the total amount of CAT) and number of cells in the S phase (3 h after HU removal) determined by three independent assays in cell lines transfected with pXCATHSP83, pXCAT5'III/3'I, pXCAT5'H2A and pXCAT3'H2A constructs. (B) Graphic showing the percentages of CAT mRNA on polysomes in the same cell lines. Data were obtained from the densitometric analysis of the blots performed with the RNAs separated on sucrose gradients from cell lines transfected with pXCATHSP83, pXCAT5'III/3'I, pXCAT5'H2A and pXCAT3'H2A constructs at G1 and S phase for three independent assays. Whereas the expression of CAT is regulated in a similar form to that observed for the endogenous H4 histone in the cell line transfected with pXCAT3'H2A construct, in the pXCAT5'H2A cell line CAT transcripts are translated in the G1 phase although an increased translation was observed in the S phase of the cell cycle. Taking into account that the coding region of different reporter genes may affect the translational efficiency in kinetoplastids  we decided to study the regulatory role of the H2A 5' UTR with an His-tagged H2A as reporter gene, instead of CAT. Therefore, we created a new construct named pXhisH2A5'H2A in which the sequence coding for six Histidine residues, followed by the H2A4 coding region was flanked by the 5' regions derived from gene H2A4 and 3' regions derived from HSP83 gene (Fig 8A). The de novo synthesis of His-H2A was determined by immunoprecipitation using an anti-His monoclonal antibody. This was performed on nuclear protein extracts obtained from cells progressing along the cell cycle and labelled with [35S]methionine. In Fig. 8B–C, the autoradiograph exposure of the blot and the densitometric analysis obtained in one of the two independent experiments are shown. An accumulation of the de novo synthesized His-H2A at the S phase was observed. The ratio between the de novo synthesis of the His-H2A protein and number of cells in the S phase (0.35 ± 0.12) is similar to that obtained for CAT protein in cell line transfected with pXCAT5'H2A (0.29 ± 0.09). However, it was also shown that the de novo synthesis of His-H2A was maintained when cells progressed into the G2/M phase. The polysomal profiles of the His-H2A transcripts have been determined in cells transfected with the pXhisH2A5'H2A construct in the G1 and the S phase (Fig. 8D). The results of two independent assays revealed an active translation of these transcripts during the G1 phase (32.4 ± 6.09) with an increase in the percentage of transcripts located in the secondary peak 3 h after HU release (47.1 ± 5.12) (Fig. 8E). On the other hand, and as a consequence of the replacement of CAT to His-H2A we observed that the position of the His-H2A mRNAs secondary peak on the sucrose gradient was similar to that observed for the H4 transcripts used as control of the endogenous expression (Fig. 8D). Preferential translation induced in the S phase by the H2A4 5'UTR is maintained when a Histidine tagged H2A was employed as a reporter. (A) Schematic representation of the pXhisH2A5'H2A construct. The position of the 6 × Histidine tag coding region is indicated. (B) Immunoprecipitation of the His-H2A of nuclear protein extracts from 35S-labelled L. infantum promastigotes transfected with pXhisH2A5'UTRH2A and treated with 5 mM HU either for 12 h (lane 0) or at the indicated time period (in h) after removal of the drug. The autoradiography (De novo panel) and western blot performed with the anti-His monoclonal antibody (TP panel) is shown. Data correspond to one representative experiment of two independent assays with similar results. (C) Densitometric analysis showing the ratio between de novo synthesis of His-H2A and total amount of His-H2A (columns). The percentage of cells in the S phase is also included (black line). (D) Northern blots prepared with RNA samples separated by sucrose gradients from promastigotes transfected with pXhisH2A5'H2A and treated 12 h with HU (lane 0) or 3 h after drug removal were sequentially hybridized with the 6 × His and the H4 probe. The autoradiographic exposure of the blots and the densitometric analysis is shown. Data correspond to one representative experiment of two independent assays with similar results. (E) Graphic showing the percentages of His-H2A and H4 mRNAs on polysomes at G1 and at the S phase obtained from two independent assays. These results reinforce the implication of the H2A 5' UTR, in addition to that of the 3' UTR, in the translation of the histone transcripts during the S phase of the cell cycle since for both reporters a slight increase was observed in the de novo synthesis and in the percentage of mRNAs located into the polysome fractions. The role of this region in the cell cycle expression of histone genes is related with an enhancement of translation initiation of H2A transcripts when these have access to the translational machinery. Changes in the steady-state levels of Leishmania regulated transcripts in response to different stimuli have been associated with post-transcriptional events controlling mRNA stability. This kind of regulation involves sequences present mainly in the divergent 3' UTRs, although sequences located at the 5' UTRs and in some cases on intergenic regions (IR) have also been implicated [23, 31]. The presence of divergent sequences in the 3' UTR of genes coding for nearly identical proteins has been correlated with a differential pattern of expression of these genes during the parasite life cycle stages as this occurs for example with the promastigote major surface protease GP63  or during heat shock as occurs in the L. infantum HSP70 gene family [33, 34]. L. infantum histone H2A coding genes are organized in tandem as two independent clusters, and like many housekeeping genes they possess a high sequence conservation in the coding regions and high divergence in the 5' and 3' UTRs . The data presented in this paper indicate that contrary to what has been shown for other gene families, the sequence differences in the 5' and 3' UTRs of H2A gene copies are not implicated in a differential expression of this gene. In fact, a similar S phase dependent, de novo synthesized CAT protein was detected in parasite cell lines stably transfected with different constructs containing distinct combinations of the histone H2A 5' and 3' UTR regions. In the last few years an increasing number of reports show that sequences located at the 3' UTR of different Leishmania genes are implicated in the regulation of mRNA translation (reviewed in ). It has been shown that a 450-nt long region within the amastin 3' UTR confers amastigote-specific gene expression by a mechanism that leads to an increase in mRNA translation . This sequence is also present in the 3' UTRs of many protein coding genes that are specifically expressed in the amastigote stage of the parasite. During heat shock, the HSP83 3' UTR has been involved in the preferential translation of the HSP83 genes in L. amazonensis and L. infantum [28, 37]. The data presented in this work show that in parasites transfected with the pXCAT5'III/3'I construct (containing the regulatory regions of gene H2A4) CAT expression is regulated mainly at the translational level in a cell cycle dependent manner similarly to the endogenous Leishmania histones . In fact, in the transfected parasites there were not significant variations in the steady-state levels of CAT mRNAs along the cell cycle whereas drastic changes in the polysome profiles of histone mRNAs were observed during the progression from the G1 to the S phase, concomitant with an increase in the de novo synthesis of CAT in the S phase of the cell cycle. Furthermore, our data show that the H2A 3' UTR is implicated in the cell cycle dependent translational control of CAT. The presence of the H2A 3'UTR in the CAT transcripts was associated with the accumulation of the mRNAs in a translational incompetent state in the G1 phase. A similar accumulation of untranslated transcripts has been described for some Leishmania HSP70 bearing specific 3'UTR regions . Most likely, these parasites accumulate untranslated transcripts in order to mount rapid responses to environmental changes. The characterization of the regulatory protein(s) that interact with the H2A 3' UTR requires the definition of the mRNA signals involved in the interactions. In Leishmania only a few post-transcriptional regulatory cis-regulatory elements have been described (recently reviewed in ), and many of them involve large regions on the 3' UTRs of the mRNAs. Interestingly, the existence of a defined conserved cis element in the 3' UTR of almost all Leishmania histone genes (CATAGA followed by a T box) has been described . The presence of the CATAGA box in the 5' and 3' UTRs of some genes implicated with Leishmania DNA metabolism has been correlated with the accumulation of their mRNAs in the S phase of the cell cycle . Whether or not this element plays a role in the translational control of the expression of the Leishmania histone proteins along the cell cycle requires further elucidation. Definition of the critical regulatory sequences located in the 3' UTR of the H2A genes will allow the characterization of the control mechanism operating in these transcripts (a translational repression out of the S phase or an induced translation in the S phase). Little is known about the implication of 5' UTR regions in mRNA translation in Leishmania. The Leishmania HSP83 5' UTR was described to play a role in the preferential translation of parasite HSP83 during heat shock, that depends on the presence of the HSP83 3'UTR in the same transcripts . Our data show that the H2A 5' UTR has a minor contribution in the cell cycle dependent expression of histone H2A. Both, CAT and His-H2A transcripts bearing histone H2A 5' UTR were translated at the G1 phase although they were more efficiently translated in the S phase. It has been reported that the translational efficiency in kinetoplastids can be affected by the reporter employed [30, 40]. In our experiments, by changing the reporters differences were only observed when cells reached the G2/M phase. This indicates that further analysis should be done in order to clarify the role of this region in the cell cycle regulation of Leishmania histone genes. In higher eukaryotes sequence elements located in the 5' UTRs are usually involved in the interactions of factor(s) that down-regulate the level of translation (reviewed in [41, 42]). On the other hand, 5' UTRs cis elements that allow the interaction of translational enhancers have also been described [43, 44]. The mechanism underlying the 5' UTR mediated translation regulation of histone H2A 5' UTR is still unclear. Both, translational activators interacting in the S phase or translational repressors interacting out of the S phase could be responsible for the observed effects. Promastigotes of Leishmania infantum (M/CAN/ES/96/BCN150) were grown at 26°C in RPMI 1640 medium (Gibco, Paisley, U.K.), supplemented with 10% (v/v) heat-inactivated foetal calf serum (ICN Pharmaceuticals, Basingstoke, Hants, U.K.). Experimental cultures were initiated at 1 × 106 promastigotes/ml and harvested for study in the exponential phase of growth (6 × 106 promastigotes/ml). For the synchronization of DNA replication, parasites in the exponential phase of growth were treated with 5 mM hydroxyurea (HU) for 12 h. Then, parasites were harvested, washed twice with PBS and resuspended in fresh medium without the drug. Different phases of the Leishmania cell cycle were determined by flow-cytometric analysis of DNA content in promastigotes stained with propidium iodide as described . The analysis of the polysomal distribution of CAT mRNAs was performed by cytosolic fractionation in linear 15–40% (w/v) sucrose gradients as previously described . After fractionation, RNA was separated on denaturing 1% agarose-formaldehyde gels and electrotransferred to nylon membranes using an LKB system (Amersham Biosciences). Total L. infantum RNA was isolated from the different cell lines as described previously . Northern blots were hybridized with a oligonucleotide complementary to the 3' terminal region of the coding region from the CAT gene (5'-TTACGCCCCGCCCTGCCACT-3') or a oligonucleotide complementary to the sequence coding for the 6 × His tag (5'-GTGATGGTGATGGTGATG 3') labelled at the 5' end using T4 polynucleotide kinase and gamma- [32P]ATP as described . Hybridization was performed at 55°C in 6 × NET buffer (0.9 M NaCl, 6 mM EDTA, 0.5% SDS, 0.09 M Tris-HCl (pH 7.5), and 0.25 mg ml-1 of herring sperm DNA). Five post-hybridization washes were performed in 6 × SSC buffer (0.9 M NaCl, 0.09 M sodium citrate) at room temperature. A final wash of 10 min was performed at 55°C in the same buffer. When indicated, and for re-use, blots were treated with 0.1% SDS for 15 min at 95°C to remove the previous probe and hybridized with a L. infantum histone H4 probe (clone LiH4-1 ) or a L. infantum histone H2A probe (clone rLiH2A-Ct-Q ) coding for the C-terminal 67 aminoacids of the H2A protein labelled by nick translation as described . Hybridization was performed in 50% (v/v) formamide, 6 × SSC buffer (0.9 M NaCl, 0.09 M sodium citrate), 0.1% SDS and 0.25 mg ml-1 of herring sperm DNA at 42°C overnight. Final post-hybridization washes were performed in 0.1 × SSC (15 mM NaCl, 1.5 mM sodium citrate) plus 0.2% SDS at 50°C for 1 h.
Different constructs were generated using regulatory regions derived from the L. infantum H2A gene locus 2 containing H2A4, H2A5 and H2A6 genes (accession number AJ419627). Clone pBls5'UTR-II containing a DNA fragment that includes the 5'UTR from gene H2A5 along with upstream sequences (including the 3' UTR from gene H2A4 and the intergenic region) was obtained by PCR using the following primers: forward, 5'-TCCCCCGGG GTCCTCCGGCCTGACAGCGC-3'; reverse, 5'- GCGATATC CATGGTTGCGGAAAGGAGAG-3' (underlined are restriction sites included in the primers to facilitate cloning). The PCR product was digested with Cfr 9I and Eco RV restriction enzymes (cut sites underlined) and cloned in pBluescript KS(-) (pBls). An Eco RI and Eco RV DNA clone, named pBls5'UTR-III, containing the 5'UTR from gene H2A4 along with upstream sequence (600 nt upstream the putative AG trans- splicing acceptor site) was also obtained by PCR using the following primers: forward, 5'-GGAATTC AACAATGCAGGGAA-3'; reverse, 5'- GCGATATC CATGGCTGCGATGGGTAGGT-3'. The 3' UTR and downstream sequences from gene H2A5 (including the intergenic region and the 5' UTR from gene H2A6) were PCR amplified using the following primers: forward, 5'-CCCAAGCTT AGCACACCTACCCCTCTCTT-3'; reverse 5'-GCGTCGACGGATCC CATGGCTGCGATGGGTAGGT). The PCR insert was digested with Hind III + Sal I and cloned in pBls (clone pBl3'UTR-III). The 3' UTR and downstream sequences derived from gene H2A4 (including the intergenic region and the 5' UTR from gene H2A5) was PCR amplified using the following primers: forward, 5'- CCATCGAT GTCCTCCGGCCTGACAGCGC-3'; reverse, 5' GCGTCGAC GGATCCCATGGTTGCGGAAAGGAGAC-3'. The PCR insert was digested with Cla I and Sal I and cloned in pBls (clone pBl3'UTR-I). As control, the region 3'UTR+IR+5'UTR located between coding regions of genes 1 and 2 of the L. infantum HSP83 gene cluster was employed . For that purpose this region was PCR amplified including different restriction enzyme cut sites. When this region was placed upstream the reporter gene the following primers were employed: forward, 5'- CGGGATCC CGCGCACTGCTCTTTACAT-3'; and reverse 5'-TGCCTGCAG CGTCTCCGTCATGGTTGCAG-3'. The PCR product was digested with Bam HI and Pst I and cloned in pBls (clone pBls5'UTR-HSP83). When this region was placed downstream the reporter gene the following primers were used: forward, 5'-CGAAGCTT AGGTGGACTGAGCCGGTA-3'; and reverse 5'-GCGTCGACGGATCC GCTCTCCGTCATGGTTGCAG-3'. The PCR product was digested with Hind III and Sal I and cloned in pBls (clone pBls3'UTR-HSP83). Both clones were generously provided by Dr Ruth Larreta. pXCAT5'III/3'I in which CAT gene is flanked by both regulatory regions of gene H2A4. pXCAT5'III/3'III in which CAT gene is flanked by the 5'-regulatory regions of gene H2A4 and the 3'-regulatory regions of gene H2A5. pXCAT5'II/3'I in which CAT gene is flanked by the 5'-regulatory regions of gene H2A5 and the 3'-regulatory regions of gene H2A4. pXCAT5'II/3'III in which CAT gene is flanked by the 5'- and 3'-regulatory regions of gene H2A5. 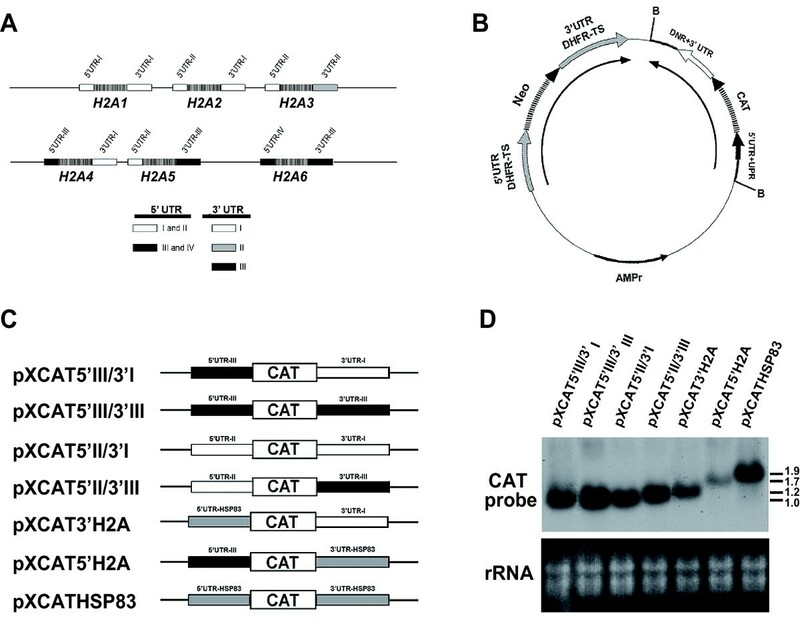 pXCAT3'H2A in which CAT gene is flanked by the 5'-regulatory regions of the HSP83 and the 3'-regulatory regions of gene H2A4. pXCAT5'H2A in which CAT gene is flanked by the 5'-regulatory regions of gene H2A4 and the 3'-regulatory regions of gene HSP83. pXCATHSP83 in which CAT gene is flanked by the regulatory regions of gene HSP83. To determine the sites of poly(A) and splice leader addition in the CAT transcripts in the different constructs, cDNAs were generated by reverse transcription of total RNA extracted from the different cell lines. A (dT)18 primer that included the Cla I restriction sequence (5'-CCATCGAT TTTTTTTTTTTTTTTTT-3') namely CdT, was employed for reverse transcription of the transcripts containing the 3' UTR of gene H2A4. A (dT)18 primer that included the Hind III restriction sequence (5'-CCAAGCTT TTTTTTTTTTTTTTTT-3'), namely HdT was employed for reverse transcription of the transcripts containing the 3' UTR of gene H2A5 and gene HSP83. Reverse transcriptions steps were performed with SuperScript™ II reverse transcriptase (Invitrogen, Carlsbad, CA, U.S.A.) following the manufacturer's protocol (2 μg of total RNA per reaction). To map the 5' UTR end of the CAT transcripts an aliquot of the different cDNAs was PCR amplified using the following primers: forward, 5'-GCGATATC GCTATATAAGTATCAGTTTCTGTAC-3' (underlined the EcoR V cut site) derived from the Leishmania splice leader sequence; reverse, 5'- CCCAAGCTT ACGCCCCGCCCTGCCACT -3' (underlined the Hind III cut site) derived from the CAT gene coding region. The obtained PCR inserts were directly sequenced using a primer reverse and complement to the nucleotides 308–327 of the CAT gene coding region (5'-GTATTCACTCCAGAGCGATG-3'). To map the 3' UTR end of the CAT transcripts a forward primer derived from the first nucleotides coding for the CAT protein (5'-GCGATATC ATGGAGAAAAAAATCACTGG-3') was employed in combination with CdT or HdT. The PCR inserts containing the H2A4 or H2A5 3'UTRs were directly sequenced using a primer derived from nucleotides positions 309–328 of the CAT gene coding region (5'-ATCGCTCTGGAGTGAATACC-3'). For the sequencing of the 3' boundaries of CAT transcripts containing the 3' UTR of gene HSP83, a primer derived from nucleotides 661–670 of this sequence (5'- CGGCGTGGCAGATCGGGATG- 3') was employed. In all constructs containing the 5' UTR from gene H2A4 the trans-splicing acceptor site was located 66 nucleotides upstream from the beginning of the H2A4 coding region (position 1611 of the H2A Locus 2 ; GenBank™/EBI Data Bank accession number AJ419627). In all constructs containing the 5' UTR from gene H2A5 the trans-splicing acceptor site was located 105 nucleotides upstream from the beginning of the H2A5 coding region (position 2609 of the H2A Locus 2 ; GenBank™/EBI Data Bank accession number AJ419627). In the two constructs containing the 5'UTR from gene HSP83 the trans-splicing acceptor site was located 290 nucleotides upstream from the beginning of the HSP83 coding region (GenBank™/EBI Data Bank X87770) the same position described for the endogenous HSP83 transcripts . In all constructs containing the 3' UTR from gene H2A4 the polyadenilation site of the 3' UTR was determined to be at nucleotide 211 from the stop codon (position 2286 of the H2A Locus 2 ; GenBank™/EBI Data Bank accession number AJ419627). In all constructs containing the 3' UTR from gene H2A5 the polyadenilation site of the 3' UTR was determined to be at nucleotide 305 from the stop codon (position 3418 of the H2A Locus 2 ; GenBank™/EBI Data Bank accession number AJ419627). In the two constructs containing the 3' UTR from gene HSP83 the polyadenilation site of the 3' UTR was determined to be at nucleotide 867 from the stop codon (GenBank™/EBI Data Bank X87770), 29 nucleotides upstream to the position reported for the endogenous HSP83 transcripts. Thus, although an alternative sequence was employed in the CAT transcripts bearing the HSP83 3'UTR, the length of this region is identical in both pXCATHSP83 and pXCAT5'H2A constructs. For protein labelling, 10 ml aliquots of promastigotes at the exponential phase of growth were removed at different time periods after HU removal, washed twice with PBS and resuspended in 100 μl of Dulbecco's medium (without Methionine and Cysteine) supplemented with 7 μl of the Pro-mixTM 35S in vitro cell-labelling mix containing L- [35S]methionine and L- [35S]cysteine (1 mCi ml-1 and 1000 Ci mmol-1 respectively; Amersham Biosciences), during 60 min at 26°C. The labelling medium was also supplemented with 5 mM HU for aliquots taken at zero time. Analysis of the de novo CAT synthesis was performed on 35S-labelled promastigotes (5 × 107 cells) by immunoprecipitation with an anti-CAT rabbit polyclonal serum (Sigma-Aldrich, St. Louis.MO) as described in . Analysis of the novo His-H2A synthesis was performed on 35S-labelled promastigotes (5 × 107 cells) by immunoprecipitation with an anti-His mouse monoclonal antibody (Sigma-Aldrich, St. Louis. MO). For that purpose, parasite nuclear fractions were extracted after labelling as described . Briefly, labelled promastigotes were pelleted, washed twice in ice-cold PBS, resuspended in 400 μl of prechilled buffer A (10 mM Hepes (pH 7.5), 10 mM KCl, 0.1 mM EDTA, 0.1 mM EGTA, 1 mM Dithiothreitol, 0.5 mM PMSF), and incubated for 15 min on ice. After incubation, Nonidet P40 was added to a final concentration of 0.6%, and cells were lysed by vigorous vortex-mixing for 10 s, and immediately pelleted in a microfuge (13000 g). The pelleted nuclei were resuspended in 100 μl of lysis buffer (1% SDS, 10 mM EDTA (pH 8.0), 50 mM Tris HCl (pH 8.0), 150 mM NaCl, 1% Triton X-100, 1 mM PMSF, 8 μg ml-1 Leupeptin, 4 μg ml-1 Pepstatin, 4 μg ml-1 Aprotinin) and sonicated for 30 min in a water bath at 4°C for clearance of nuclei acids. After lysis, samples were microfuged for 15 min and the supernatant was diluted in 675 μl of ChIP buffer (0.01% SDS, 1.1% Triton X-100, 1.2 mM EDTA (pH 8.0), 16.7 mM Tris-HCl (pH 8.1), 167 mM NaCl,1 mM PMSF, 8 μg ml-1, Leupeptin, 4 μg ml-1 Pepstatin, 4 μg ml-1 Aprotinin), mixed with 3 μl of anti-His monoclonal antibody (Qiagen, Hilden, Germany) and incubated on an orbital rotator for 15 h at 4°C. Agarose beads (15 μl) conjugated with Protein G (Sigma) were equilibrated in 50 μl of ChIP buffer added to the Leishmania nuclear extract/anti His monoclonal antibody mixture. The mixture was incubated on a rotator for 2 h at 4°C. The beads were collected by centrifugation and washed three times with 0.5 ml of buffer A (10 mM Tris-HCl (pH 8.0), 30 mM NaCl, 2% Triton X-100), twice in 0.5 ml of buffer B (10 mM Tris-HCl (pH 8.0), 50 mM NaCl, 2% Triton X-100) and once in 0.5 ml of buffer C (10 mM Tris-HCl (pH 8.0) 0.05% Triton X-100). Finally, the beads were resuspended in 60 μl of 2 × Laemmli's buffer. Immunoprecipitated proteins were resolved by SDS-PAGE on 10% acrylamide gels and transferred on to nitrocellulose membranes (Amersham Bioscience, Aylesbury, UK) in a Mini-protein system (Bio-Rad Laboratories, Hercules, CA, U.S.A.) and exposed to an autoradiographic film. Total amount of immunoprecipitated CAT and His-H2A was analysed by Western blotting using the anti-CAT serum or the anti-His monoclonal antibody. As secondary antibody an anti-rabbit IgG-peroxidase immunoconjugate or anti-mouse IgG-peroxidase immunoconjugate (Nordic Immunologic, Tilburg, The Netherlands) was used. The specific binding was revealed with the ECL® Western-blotting detection reagent (Amersham Biosciences). The autoradiographs were scanned with a laser densitometer (Image QuantTM version 3.0; Molecular Dynamics). Measurements were performed under conditions in which a linear correlation existed between the amount of proteins or RNA and the band intensity on the autoradiographs. We gratefully acknowledge Dr. Ruth Larreta for pBls5'UTR-HSP83 and pBls3'UTR-HSP83 plasmids. We also thank Christos Haralambous and Despina Smirlis for their helpful discussion related to this manuscript. This work was supported by Grants ISCIII-RETIC RD06/0021/0008-FEDER, FIS05/0453 and FISPI080101 from Ministerio de Sanidad y Consumo (Spain). Also, an institutional grant from Fundación Ramón Areces is acknowledged. DRA and MS carried out the construction of the transfection plasmids and performed the immunoprecipitation assays shown in Fig. 2, 5, 6 and 7. LR performed the mapping of RNA ends by RT-PCR. DRA performed the Northern blots (Fig. 1 and 4) and the analysis of RNA fractionation in sucrose gradient shown in Fig., 4, 5, 6, 7 and 8. SI performed the determination by flow-cytometric analysis of DNA content in promastigotes stained with propidium iodide shown in Fig. 2, 4, 5, 6, 7 and 8. KS critically read the manuscript. PB participated in the experimental design and read and edited the manuscript. VMG and CA gave laboratory support and critically read the manuscript. All authors read and approved the final manuscript.